With the holidays finally behind us, it’s time to gear up for the new year. For me, this is a great time to cleanse the house and get it ready for a fresh start. Whether I’m using the right colors or adding plants or running an Oil Diffuser, there are many ways to create a relaxing vibe in the home. 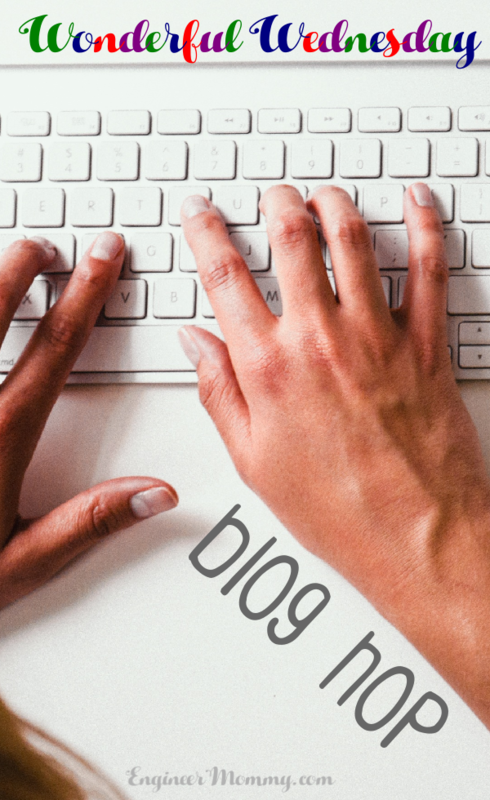 Keep reading to find out how you too can create a sense of calm in your space. There’s something about a messy, disorganized space that just creates an unsettled feeling. When you take some time to tame the clutter, you can enjoy a calming mood in your home. Start by tackling your most-frequented rooms first, such as the kitchen, bedrooms, and living room. One trick I like to employ is to find storage solutions that also serve as decor, like a decorative storage ottoman or bookcase w/ doors. 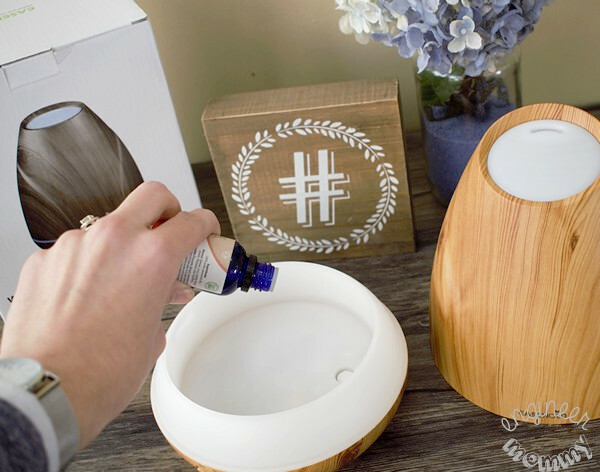 Setting a relaxing mood is a breeze with a great oil diffuser. 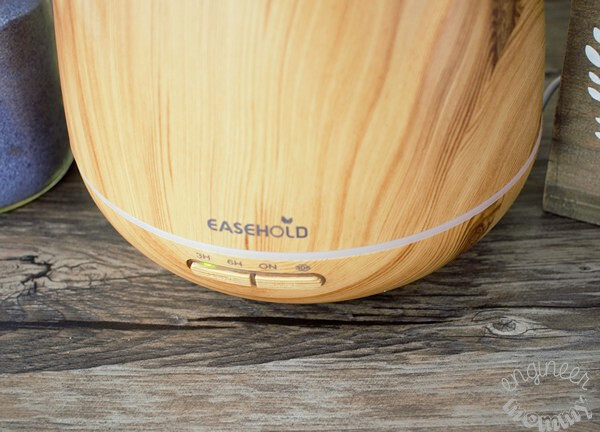 I recently checked out the Easehold Aromatherapy Essential Oil Diffuser and I’m totally impressed by its features. This ultrasonic humidifier features a 20-hour intermittent mist, 4 timer settings and 7 mood lights for plenty of easy customization options. 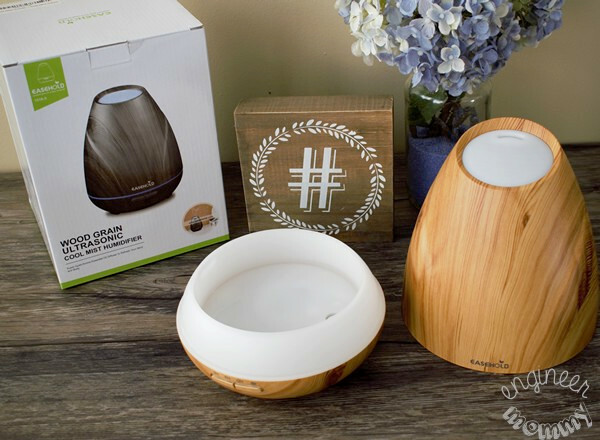 The sleek wood-grain exterior of the Easehold Oil Diffuser blends in seamlessly with the decor in my home office. Isn’t the wood grain totally chic?! I really love the 30-second intermittent mist mode of this diffuser. With a reservoir capacity of 400mL, the unit can run for up to 20 hours on this mode. Impressive, right? I always like to add some essential oils directly into the reservoir to fill my air with a relaxing scent. I simply add 3-5 drops into the water in the tank. My favorite oils to use are lavender, geranium and peppermint. The timer can be set to four different settings (3H/6H/ON/30S). I like to use the 3H feature at bedtime and the 6H feature in the morning. There’s even a high/low mist control function and I love controlling so many elements of this diffuser. By the way, when the unit runs out of the water, it shuts off automatically. 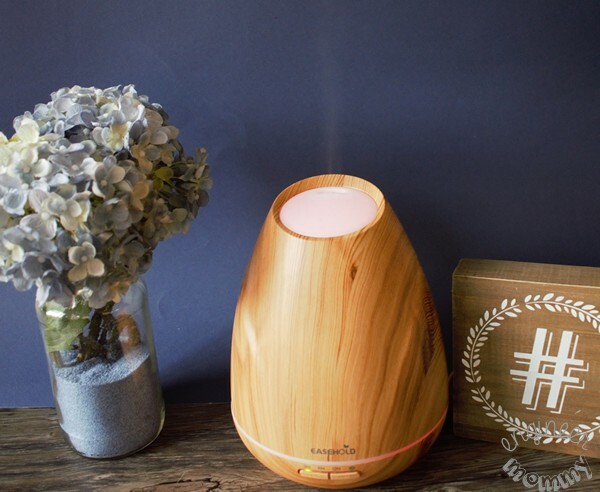 By the way, I have been using this Easehold oil diffuser in my office and I can say that this unit is whisper-quiet! There are also 7 LED lights (they can be switched from bright to dim). You can use them as mood lights or nightlights. During winter, the indoor air can get super dry. 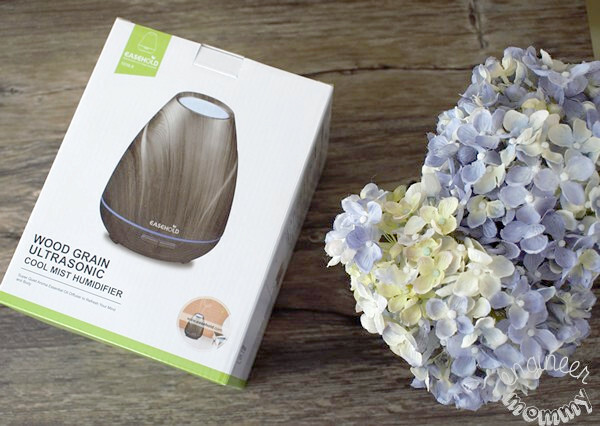 To add more moisture into the air, the Easehold Diffuser/Humidifier is a wonderful, stylish solution. *TIP: If you want a thicker mist, simply remove some water from the reservoir. Yes, less water means more moisture! Did you know that certain colors have a big impact on one’s mood? While some colors have an energizing effect, others have a relaxing effect. Colors can even affect your mood and energy. Colors that tend to energize are oranges and reds. Colors that tend to calm are grays & blues. 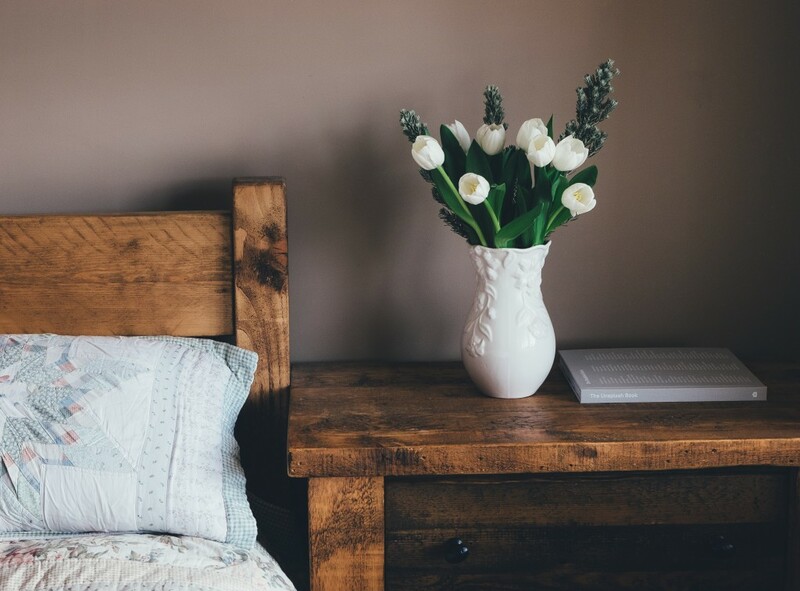 If you’re trying to create a relaxing mood in a bedroom, for example, consider painting the walls gray or blue. Set up zones for efficiency! Ever feel like you are scrambling to prepare breakfast in the morning, running around the ktichen to gather supplies? Or when it’s time to wrap a gift, are you running all over the house finding scissors, tape, ribbons, and gift tags? 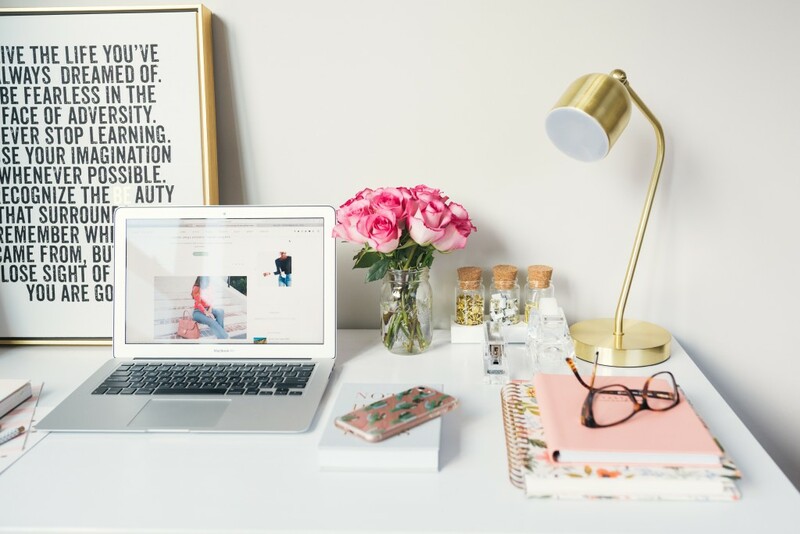 Set up work stations that enable you to have everything you need to accomplish a certain task in one spot. For example, a coffee station would include coffee grounds, creamer, cocoa powder, cinnamon, sweetener, stirrers and more. A gift wrap station would include wrapping paper, ribbons, tags, cards, scissors, embellishments and more. By streamlining the work that has to be done, you will set the mood for a relaxed vibe. Bringing the outdoors inside is a great way to create a calm mood in the home. In fact, there’s nothing better than adding some fresh, live plants to the home. I actually try to have plants in every room of my home. 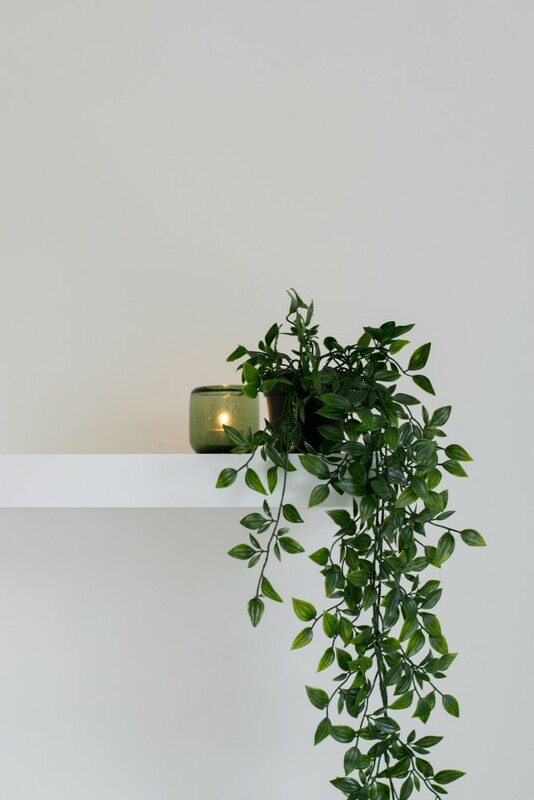 Incorporating some fresh greenery into the home is refreshing and easy. You don’t even need to add a huge plant; a simple desktop one would work just as well. Did you know that indoor air can get toxic over time, especially during the winter when the HVAC system is constantly running? 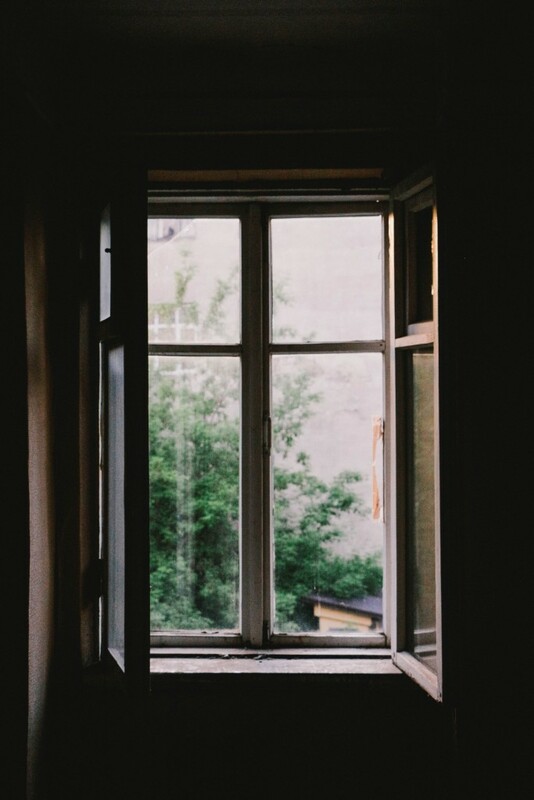 Be sure to open windows and let the fresh air get inside. The fresh breeze will help to calm the mind. How do you set a relaxing mood in the house? 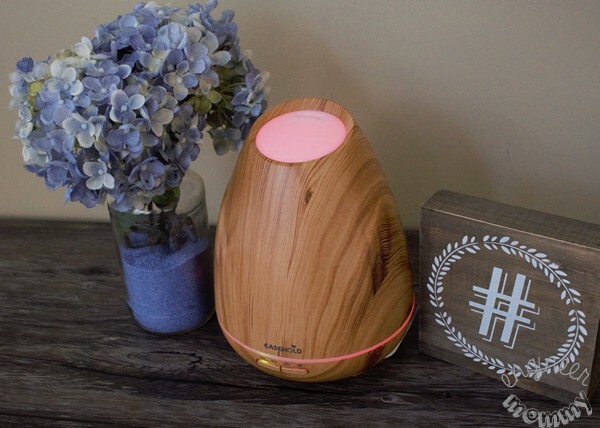 Would you love to check out the Easehold Essential Oil Diffuser? Do you add fresh plants to your home? I am all about keeping my windows open as often as I can. Today it is 16 degrees, so not today, but when the spring comes they will be open all the time. These are great tips! I love the plants, I love zones idea and I totally feel the need to have a diffuser in my house, especially my room. I love my oil diffuser and totally agree…just having a nice essential oil makes the world of a difference in mood! My favorite is Lavender, but during the holidays, love mandarin and peppermint. 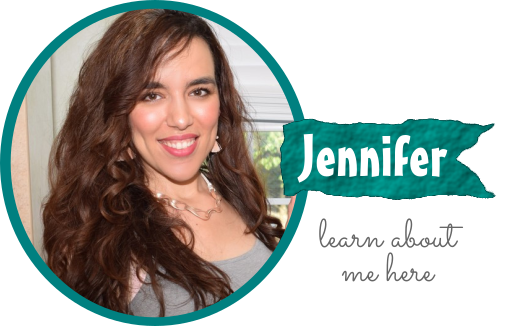 Your post reminds me… I really need to declutter my closets! 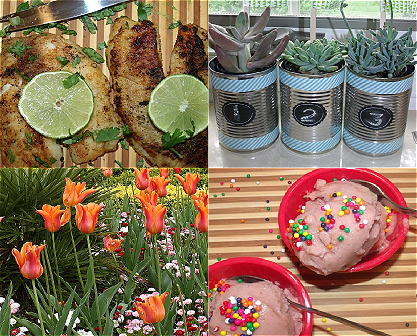 I could definitely use some things to make life at home a little calmer! It is tough when days are busy, the kids are running around, pets are making a mess, etc! I know for sure how clutter really does make me feel agitated. I am already itching to take down all the Christmas items and get them packed away so that the house feels less cluttered. Yes, I’m the same way. I’m always eager to put away Christmas items after the holiday is over. The house feels so minimalistic afterward! I live in Michigan so it’s a *little* too cold to open the windows right now 🙂 it was -4 degrees today when I woke up, ugh. Like 4 degrees out right now. I like doing that in the summer though. I’ve also heard good things about oil diffusers. I just got into oil diffusing this year and I can’t believe I’ve been missing out all this time! 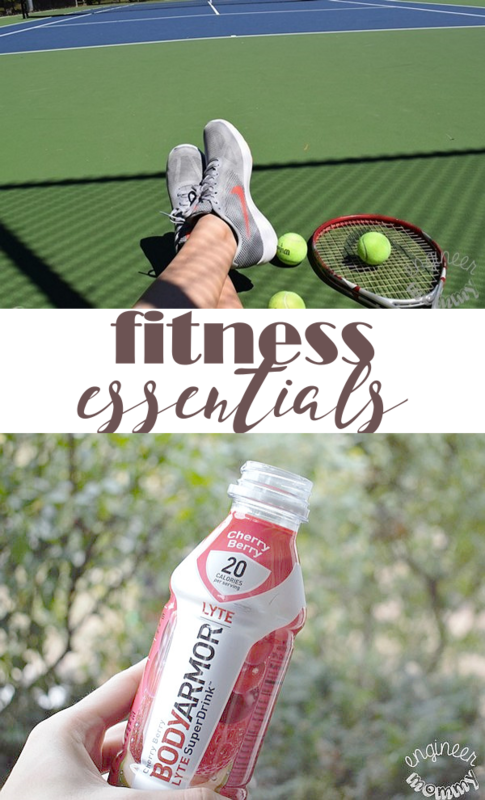 A serious game changer to get you in a relaxed state of mind. Oh man, I just hate clutter. I’m working on that. I need to pick up an oil diffuser. I always hear how great they are. I have never used an oil diffuser before but it’s definitely something I would like to try out! Love how this one looks nice and can go with a lot of my rooms’ decor! Yes, it totally adds to the decor! A clean home is the most relaxing. I’m constantly purging things, especially our closets. I need to tackle the Tupperware cabinet. These are great ideas. I use my oil diffuser all the time and gave a few as Christmas gifts too because it’s such a big help. I know! They make a perfect gift!! We open our windows all the time during summer time and Fall. I wish we won’t get sick during winter or I will open them too. I love your tips here! I wholeheartedly agree that clutter does not create a calming mood. I always feel better as soon as I de-clutter! I really love what you have done with the place. The environment is perfectly calm. I am not an essential oil users, but I do appreciate how they can improve the scent of a space. I agree with you on the greenery and sunlight aspect…they can make even a cold day beautiful! What awesome recommendations. I love calm and soothing relaxation. A calm environment is such a sacred space, and I love what you’ve done with yours.